Julia Hamilton cycles up to our shop in Farleigh Place regularly to buy her paints, and takes them back to her studio in order to create monumental pictures with them. 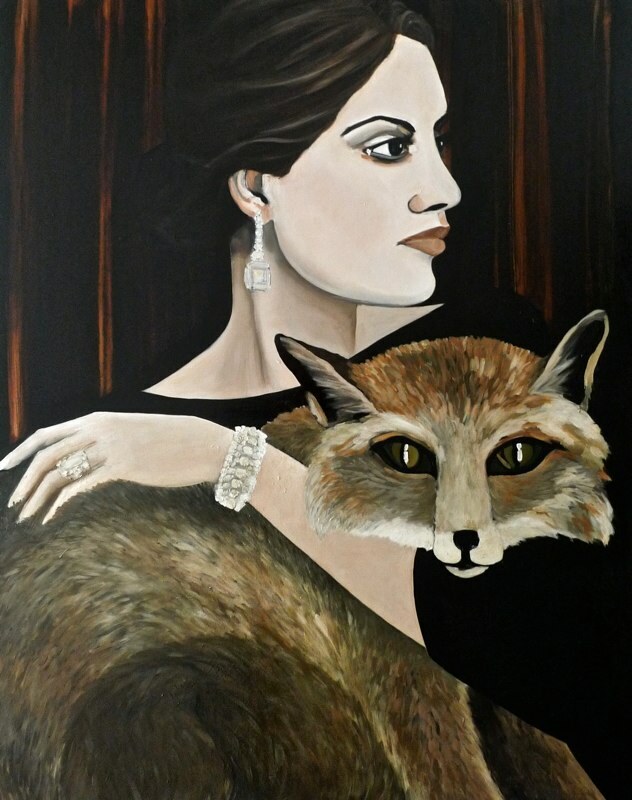 Her painting ‘Bunny Girl’ was recently hung at the 2013 Threadneedle Prize for Figurative Painting and Sculpture, and she has also exhibited recently at The London Original Print Fair, the London Art Fair and the Creekside Open at APT . A new 2 man show at St Anne’s Galleries in Lewes opens today. Her latest body of work depicts women, many of whom appear to be from the early – mid 20th century, stood against a black background. There is a strong sense of design in the work, with Hamilton reveling in the depiction of patterned fabrics. 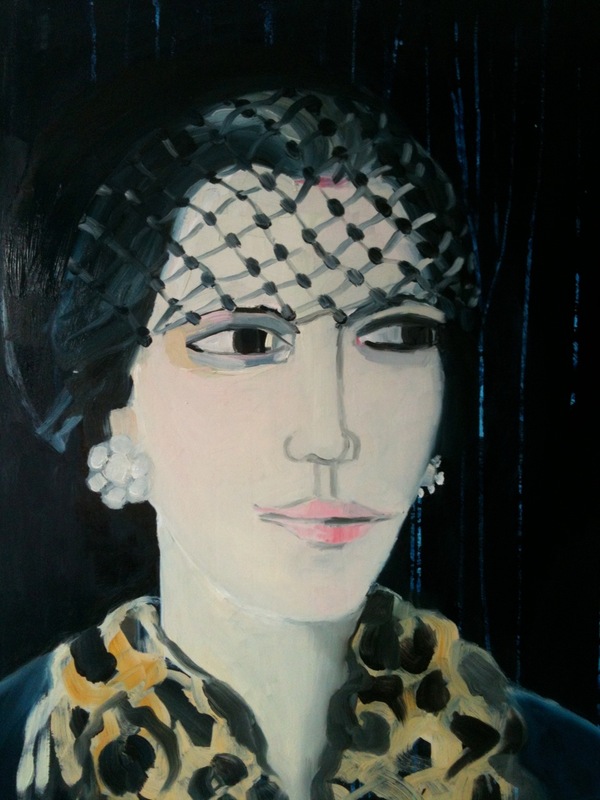 The faces she paints are strong with an underlying vulnerability, with huge gazing eyes, and a stillness that reminds me of the work of painters such as Alex Katz or Chantal Joffe. The colours she uses are cool – strong blacks and very pale pinks that at times remind me of Manet’s portraiture palette. I asked her a few questions to find out a bit more about what it might be like to be Julia Hamilton, painter and printmaker. Julia: When I first left school, I went to Exeter University and did a combined honours course in English Literature and Fine Art. The Fine Art was practical and at the art college on the other side of town, it was rather a dry course, not terribly inspiring but it is where I began my daily practice of drawing and keeping a sketch book on me at all times. I loved the university life and met some brilliant people who I am still in touch with. I came back to London and was not encouraged to be an artist, so I didn’t know what to do! Sounds silly now, but I was young and without the support of any art practice, I lost confidence. So I did a post grad diploma in publishing and printmaking at the then called LCP (now called LCC), from which I went on to get a job as a graphic designer in an agency in Chelsea. I worked there for several years, still keeping my sketchbooks going, but not showing them to anyone. Finally the time came and I’d just had enough of one too many Annual reports and company logos to design! I handed in my notice and got myself a job working behind a wonderful private members club in Soho. There I met writers, film makers, artists, one of whom encouraged me to take up my art again. I took my sketchbooks down to Central St Martins and had an interview with Norman Ackroyd and got onto the printmaking course as a post grad! I learned the traditional way of making etchings, lithographs and monoprints in a beautiful old print room smelling of turps. Sadly the building is now being turned into a hotel I think. From then on, I found myself a studio in the old Spitalfields market and bought myself an etching press. I exhibited in print exhibitions mainly and after a few years, I ventured into painting. My first painting sold via the framer that had it in his workshop, a client came in and wanted it immediately, from then on there was no holding back. I got myself into City and Guilds a few years later and did a three year painting course which I loved. I worked part time at the ICA and continued my painting practice. Ten years after that – I did my MA in Fine Art! A long winding road – but I eventually got here! My work has been shown at the Royal Academy Summer Exhibitions, The London Art Fair and many other galleries. Lisa: How do you think your time as a graphic designer has informed your painting practice? Julia: It made me realise I didn’t want to be a graphic designer! I didn’t want to work for anyone else and I didn’t want to compromise what I wanted to produce. Being a graphic designer in the late 80s was really hard work, no computers, all hand done, type and everything. I’d produce something I was pleased with but it would come back from the client with so many requests it was soul destroying. Once a proof came back and I was told the client’s wife wanted the type in blue, because it was her favourite colour and the beautiful clean text I’d typeset was reverted into traditional times roman. It was an exciting time out in the world, with Neville Brody designing The Face magazine and all that, but in the field I was in, it was very conservative. How has it informed my practice? – I suppose I do have a strong sense of design, I like the image to have a sense of balance, an abstract underlying structural core to the work. Lisa: You often create artwork based on found objects and imagery. What draws you to the found object or image? Julia: My old studio was very near a great Oxfam shop in Dalston and when I was uninspired I would often take myself up there for inspiration. I was fascinated by what people didn’t want anymore and I would imagine a story behind each object. Once there was a collection of ceramic honey pots, about 20 of them. I wish I’d bought them all now. I bought one in the shape of a bear. Back in the studio the objects started to amass, so I started to paint them. I painted one a day for a while. I was painting an object that had been designed and mass produced by someone else. I liked that and I loved the light shining off them, so I tried to paint the shininess! My painting style changed then and I used thick oily paint, I wanted to show their tackiness I suppose. The later work of objects are actually souvenirs of people I know. Often a memento of a person now gone. I wanted to somehow signify a loss and create a ghostly image. This ‘Lost Object’ series culminated in huge 2m paintings of glass jars. The technique I used there is from printmaking, putting paint on, and wiping it off. The resulting image is a ghostly white, almost photographic negative affect and this perfectly matched what I was trying to convey. A fleeting moment. Inside each object I painted a place that I remembered as a child, or a person I had known. Lisa: What is ‘Bunny Girl’ about? Julia: ‘Bunny Girl’ is a very different matter. She came from an urge to put paint back on the canvas. I kept the dark blue background from my previous object paintings but this time put the creamy ice cream like paint back on top – revisiting the painting method that I used for the ceramic objects. So I think that is why there is a kitschness to the way I paint as well as the subject matter being rather surreal. I’m still using ‘found objects’ but this time it is images of circus girls, or women from vintage magazines. 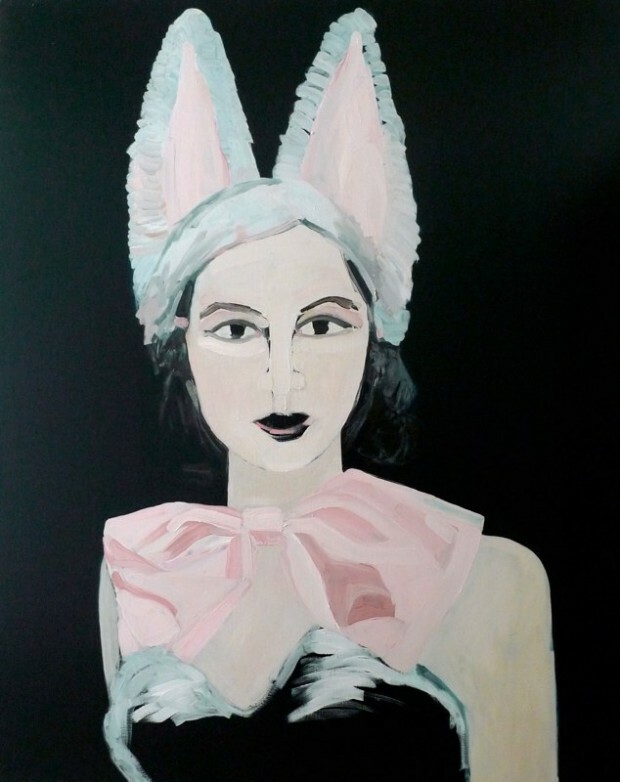 I had never painted people before and I realised I painted Bunny Girl rather like an object which taps into the long tradition of painting women in their finery from Henry VIII’s wives up to now in women’s magazines. There is still a nostalgic longing I think in this work. In the original found image, the woman was smiling but I as I was painting her I kept thinking what a ridiculous outfit this was, how demeaning in a way and yet it is funny, so her face took on this challenging stare, as if it say, ‘This is ridiculous! What are you looking at?’ It seems to represent how I feel sometimes when I’m not sure what to wear! And I feel the pressure to put on make up or dress up. I love lovely clothes, but sometimes I think it would be easier to just wear a suit! ‘Bunny Girl’ seems to encapsulate all that for me, she’s attractive but she’s also slightly sad too. Lisa: Who or what are your main influences? 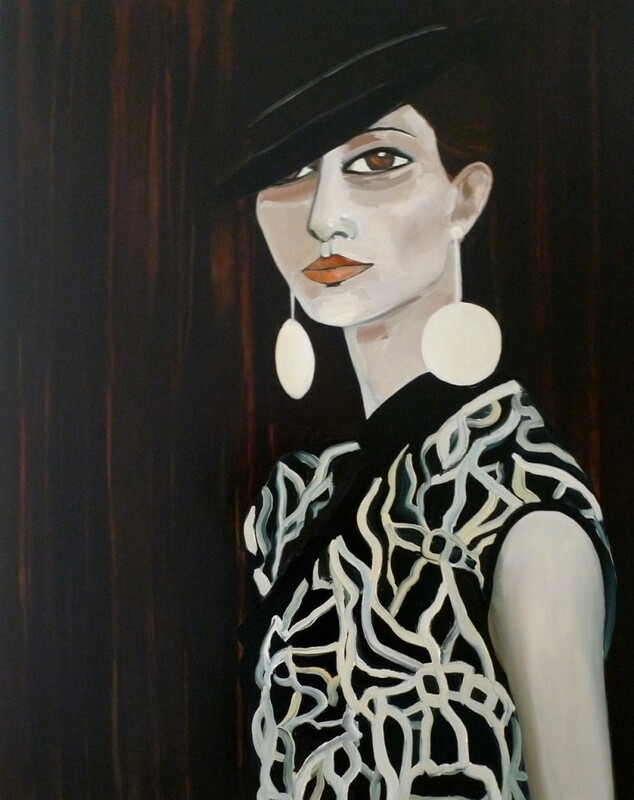 Julia: I do like Chantal Joffe’s work a lot, I love her bold brushstrokes and the huge scale of her work, I think it has strong links with Manet’s portraits of women as well. I like Matisse’s free gestures and again the luscious decorativeness of his portraits of women and the textiles behind them. I love many artists, but I suppose for this series of work I’m referencing Tudor Portraiture, Degas, Renoir, Velasquez, Gainsborough, Karen Kilmnick, Elizabeth Peyton, Lisa Milroy amongst others. I like Alex Katz too, I’m interested you spotted that, again I love the scale of his work and the boldness and pared down almost symbolic, actually graphic (harking back to my graphic days) images of women with red lips, they’re stylish, they’re cool! Lisa: How do you start a painting? Julia: I decide on the scale, I’ve usually made about four canvases at a time, I like to work in series. I have a rather arduous preparation of the canvas to complete before I start work so I set aside a week to just do the canvases and then when I’m in painting mode I can keep going. I use about three layers of thixotropic primer, each sanded down to make a really hard, shiny surface. Then I roll up the background with thick relief ink, (again left over from my printmaking days), then when that is dry, after a few days, I paint on top. I paint quickly and solidly all day. I like to get most of the painting done in a day and then I can go back and work on certain areas, like the skin. Lisa: What are your favourite paints and brushes? Julia: I’m using water soluble oil paints at the moment. I love the fact I don’t have to use white spirit or turps anymore. My skin used to react so badly to it, and I would leave the studio feeling high! Sometime I wonder if Van Gogh suffered from substance abuse without knowing it. Brushes, I’m not really an expert, long handled flat ones! I sometimes tie them to a stick so that I can stand much further back when I’m painting a large canvas. Lisa: What makes a good day in the studio? Julia: A good day, is getting up reasonably early, going for a swim in the Lido in London Fields, having a coffee afterwards in a cafe, cycling down to the studio in Shoredtich. A bit of nestling in, with the radio on, a note book, a flick through an art magazine, another coffee, then my father’s old shirt on and I start painting. I break for lunch for an hour, then back to painting in the afternoon. I work in quite a nine to five way really, I like to feel I am going to work. I leave the studio about 7pm but if I’m on a roll, I can go on later. I cycle home, feed the cat and have supper! Julia: I’m having a two person show with the painter Phillipa Cannan in Lewes at the St Anne’s Galleries from November 9th – 23rd www.stannesgalleries.com. I’ve been invited to show in ‘Small is Beautiful’ at Flowers Gallery December. I also have a page on Facebook.